Phnom Penh Municipal Court yesterday imprisoned a Nigerian man forever and his assistant to 30 years for trafficking in excess of a kilo of cocaine from Colombia to Cambodia. They were likewise fined $17,500 each. 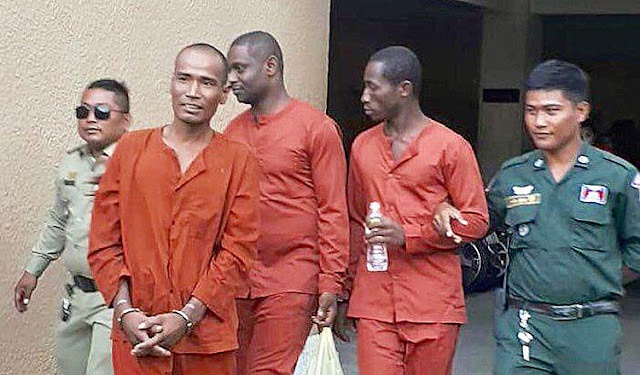 Managing Judge Seng Rithy recognized the two as Okoro Chukwuka Boniface, 28, who was indicted for medicate transport and trafficking, and Frank Obiora Dozie, 34, who was his associate. Judge Rithy said the pair was captured on July 13 a year ago by hostile to sedate police from the Interior Ministry in a joint effort with Customs and Immigration police based at the Phnom Penh International Airport. He included that after their captures, police grabbed an aggregate of 189 packs of cocaine weighing 1.1 kilos, which were covered up in a crate of phony gems couriered from Colombia to Phnom Penh by DHL. Mr Boniface conceded his blame amid his preliminary prior this month. Mr Dozie argued purity amid the preliminary, saying he knew Mr Boniface yet didn’t know about his exercises. He included that he was captured only on the grounds that he was remaining with Mr Boniface when police struck his rental house in Chom Chao cooperative. Outside the court yesterday following his condemning, Mr Dozie said he intends to document an interest.